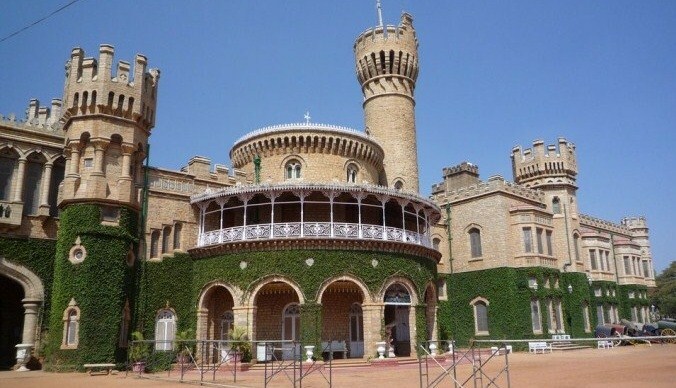 Bangalore palace is situated in the heart of Bangalore city. Bangalore is the capital of Karnataka state. The palace is very beautiful and truly it is a worth visiting. The palatious palace was built in the year 1887 by King Chamaraja Wadeyar. Surrounded by beautiful garden it is a must visit palace in Bangalore. Apart from being a major tourist destination the grounds of the palace holds a number of cultural events, marriages and rock shows. Address: Vasanth Nagar, Palace Road, Bangalore, Karnataka. The palace is spread over an area of 45,000sft is the most spacious and beautiful palace in Bangalore. The construction of the palace began in the year 1874 and was completed by 1878. Earlier the place where the palace is built was purchased by Rev Garrett in the year 1873. He was a British Guardian for minor Chamarajendra Wadiyar X. This was purchased on the personal funds of the Maharaja mainly for accommodation, education and administrative purpose of the minor Maharaja. The cost of the palace place was 40,000Rs. After the completion of the palaces many renovation has taken place. Garett was the first Principal of the central High school now known as Central College in Bangalore. John Cameron who is the person behind lalbagh making did the landscaping of the palace. The beautiful palace is built in Tudor Revival style of architecture (Developed in England during Tudor period) having towers, turrets (is a small tower projecting vertically from the wall of the building such as medieval castle) and battlements (defensive architecture such as walls, castles). The palace consists of 35 rooms and swimming pool. All the furniture was bought from Lazarus (a departmental store in US). It is believed that the palace was built on the model of Windsor Castle, the royal residence at Windsor in Berkshire. The two storied granite building has beautiful intricate carvings on the doors of the palace. The interiors of Bangalore palace are worth watching. The arches and the pillars are the main attraction in the palace. The ground floor of the palace has an open courtyard which contains granite seats. As you climb to the first floor where you have the Durbar Hall, don’t miss to see the beautiful paintings that adorn the walls of the staircase. One side of the hall contains stained glass in gothic style. The palace has many paintings including that of Raja Ravi Varma, Greek and Dutch. The courtyard has a fountain gifted by the Spanish Royal. 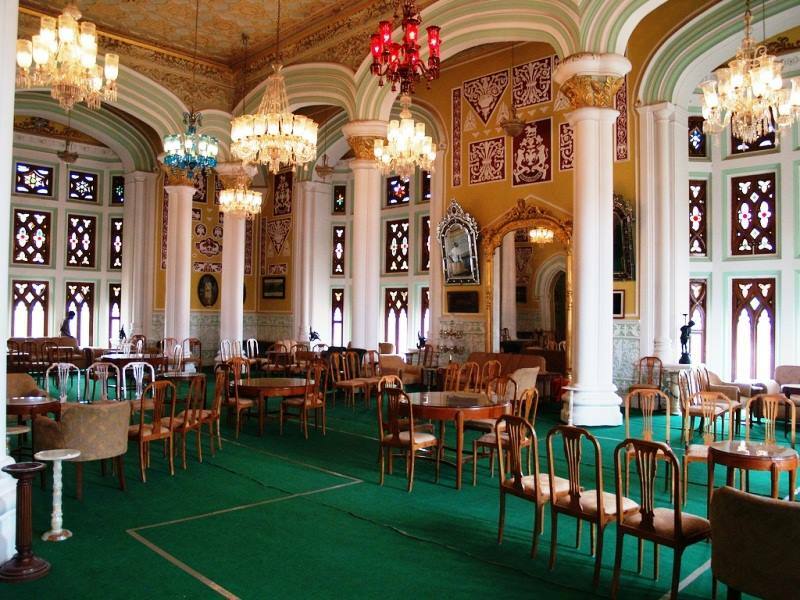 The Chandeliers, the Dining table are some of the attractions inside the palace. The palace is loaded with many elephant trophies as hunting was one of the favourite activities of the Wadiyars. It is believed that Jayachamrajendra Wadiyar has hunted around 250 tigers and many elephants. One such elephant head is placed at the entrance of the palace. The palace grounds holds many cultural events like marriage, rock music, dance etc. some of the important dignitaries who have performed here include David Guetta, Elton John, the rolling stones and many more. The palace grounds also have an amusement park called as fun world.